Dharmapuri is a village as well as a Mandal headquarters in the Karimnagar district of Telangana, India. This village earned spiritual importance because of the presence of the shrine, which is dedicated to the Lord Lakshmi Narasimha Swamy, an incarnation of Lord Vishnu. The temple has two very different idols of the lord Narasimha Swamy. The oldest of these idols is called "pata Narasimha Swamy" which means the older Narasimha Swamy and the temple that was established later is called "kotha Narasimha Swamy" which means the new one. 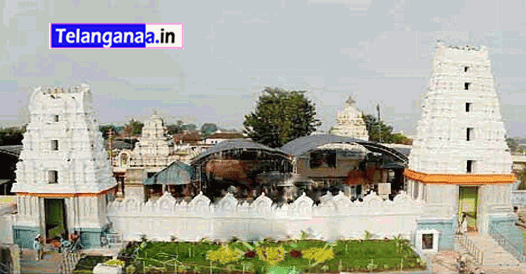 The Dharmapuri Lakshmi Narasimha Swamy Temple is one of the most important settlements of Vedic Brahmins in the state. Every year in the months of March and April, devotees of the Lord come together to celebrate the famous Dharmapuri Lakshmi Narasimha Swamy Aalaya Jatara. The town, in the month of December, gets busy for the celebration of Mokshada Ekadashi. Dharmapuri is situated at a distance of about 28–30 km from Jagityal town and 42 km from Mancherial railway station of the South Central Railway. Tourists can avail of the hotels and dining facilities available in Dharmapuri and also Jagityal town. Tourists can avail of the hotel facilities available in Jagityal town. There are also choultry facilities and lodges available in Dharmapuri. 12.00 P.M to 2.00 P.
By Road: The Dharmapuri temple town is well connected by Road. Regular Bus service is available from varous parts of Karimnagar District and state of Telangana directly. The distance from various locations to DHARMAPURI . By Rail:- The near Railway station is PEDDAPALLI and Macherial. Both the stations are located on the railway route (Railway Route Hyderabad to DELHI via Kazipet/Balaharsha ).